RPR Kits are designed for immediate worker assisted rescue! Time is one of the most valuable assets in any emergency. In an ideal situation, a trained, qualified co-worker can immediately assist another worker in the event of a fall. The system allows a capable worker to attach a raising/lowering system to the fallen workers harness D-ring, providing a means for rescue. 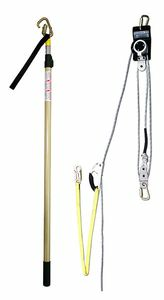 RPCC-12 rescue pole assembly w/ bag & 25’ 99B System 99 w/bag.